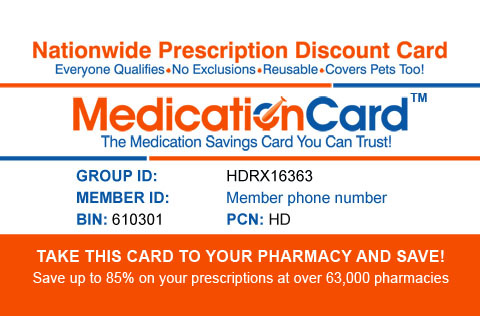 Take this card to your pharmacy and save! *** Use your cell phone, text MEDCARD to 77948 to get the card on your phone! 2. 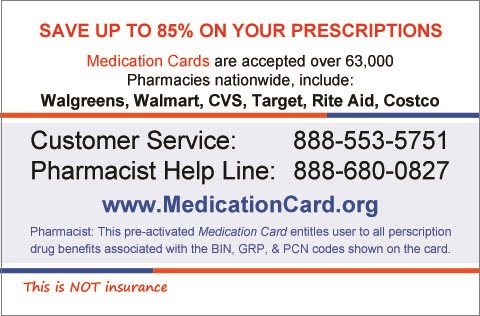 Present this Medication Card to a participating pharmacy with your prescriptions. 3. Save up to 85% on Prescriptions at over 63,000 pharmacies. 4. Card is pre-activated. This card never expires. Everyone Qualifies. Covers pets too! Note: If PRINT NOW button does not work, click the PRINT button in your web browser.